Cube zucchini. Heat large saute pan over medium heat, add about 2 tablespoons olive oil (I use light Olive oil), add zucchini, salt and pepper and saute for 3 to 4 minutes then flip zucchini and cook another 3 to 4 minutes. Add garlic and saute 1 minute. 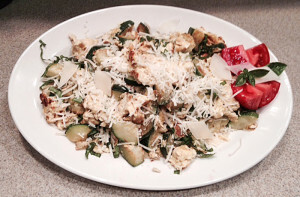 Beat eggs and pour into zucchini in pan. Scramble together until eggs set. Remove from heat and add 1 cup cheese. Plate and garnish with fresh Basil and Tomatoes and extra cheese!